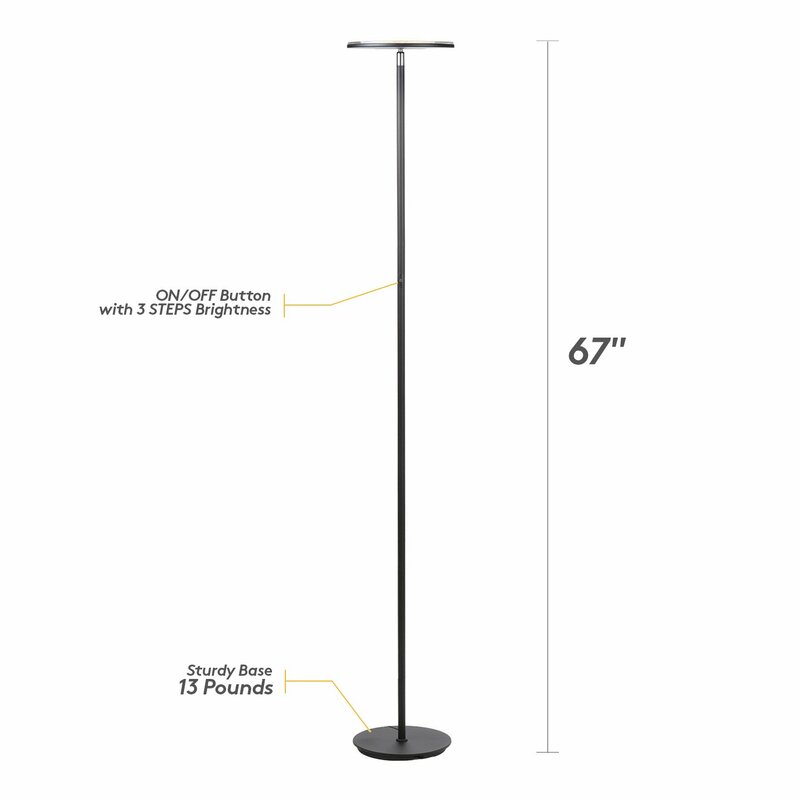 This is the Brightech Sky Flux - Modern LED Torchiere Floor Lamp For one lamp capable of both mood and task lighting, Brightech's SKY 30 Flux Edition of the LED Torchiere Floor Lamp solves your lighting needs brightly and efficiently. Our Torchiere casts a warm white glow in any direction, providing enough light for a large bedroom or 20 x 15 living room. You can adjust SKY 30’s brightness settings with a simple tap of a button. Power on, and the light comes up at color temperature of 3,000 Kelvin. Hit the power button again, and bask in a brighter 4,000K. Tap the button a third time and the color blazes at 5,000K! Within each of these settings, you can hold down on the power button, and watch the light cycle up and down through a brightness gradient. When you reach the desired ambiance, let go of the power button and SKY 30 Flux will stay at that light level. Please note, this lamp is NOT compatible with wall switches, and if a wall switch is used, there will be up to a 5 second delay. The long-lasting LED lights don’t give off heat like halogen or incandescent lighting. Equivalent to 120 incandescent watts, our built-in 30-watt power-saving LED fixture stays cool even after hours of use. Omni-directional head lets you pivot the light anywhere: over tasks on your worktable, or away into a corner. Cassandra's Review- The lamp does not give off heat, but it does heat up and the top gets so hot that it heats the pole about 4 inches down, so I would keep it away from curtains or not place a fabric on top. The light is brilliant and wonderful and I am so impressed with the difference it makes in my room. I think I was living in a cave before this lamp showed me just how bright and beautiful it can feel in my living space. I would totally be interested in reviewing more from this brand in the future because there were so many really nice options, I had a hard time choosing just one. The lamp pole was a screw together simple to put on and tighten so the whole thing took about 5 minutes to set up. I hope the light lasts for a really long time and I was thrilled with the options to cycle through mood lighting.